critics are "pushing" to find a reason to punish them, as the club is investigated by football's authorities. Uefa launched an investigation on Thursday in response to a series of claims made against the club by the German publication Der Spiegel. On Friday, the Premier League said it was looking at City's academy recruitment and financial matters. "People press and push to find something wrong," Guardiola said. Speaking before the Premier League announced its investigation, the Spaniard added: "They want to underestimate what you achieve. "I am not too concerned or worried about what people say if we win the title because what happens now with Uefa, they don't give us any credit for what we have done, believe me. I don't care. Absolutely zero." Der Spiegel has published a series of claims, based on leaked documents, that league champions City have violated FFP rules. City claim the allegations are "entirely false". Guardiola is adamant the investigations will not tarnish his achievements at City, which include winning last season's Premier League with the highest number of points and goals. He said: "If we have made mistakes we will be punished - it is what it is on and off the pitch - but I am pretty sure what we have done is incredible. "I trust what the club has done a lot because I know them but hopefully it can solves as soon as possible." 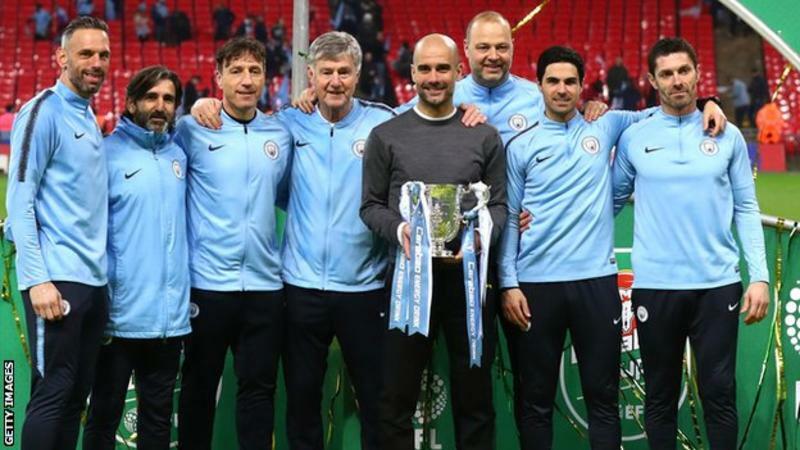 City are competing for the quadruple of trophies this season as they remain in the chase for the league title, FA Cup and Champions League - after already claiming the Carabao Cup in February.